Investing in a set of silk sheets is an incredible way to treat yourself to luxury every day of the week! For people who have difficulty sleeping, hot flashes, sensory issues, or even just those who want to give a treat to the look of their skin and hair, silk sheets can be like a dream come true! In this article we’ll take a look at the Orose Charmeuse Mulberry Silk Bed Sheet Set, digging deep to find out all of the pertinent details you need in order to make the best possible purchasing decision. 19 momme handmade silk for softer feel and long life. Some of the aspects that we love about this silk sheet set. Environmentally Safe. Made from the finest silk fibers from unique silk worms fed only mulberry leaves, this silk in produced to be completely natural, allergen free, made without chemicals or artificial dyes, and free from environmental worries. Handmade. Instead of producing the silk fabric for these sheets on a machine, these are handle with care and made by human hands. That means that the wear and tear that goes into the making is much less as the silk is handled much more gently. This gentle handling helps to increase the durability of the silk, making it last longer. For instance, sheets produced on a machine may last from 3-5 years but those made by hand could be expected to last even as long as 15 years! Cost. As with every silk sheet set we review, the cost of these can feel a bit prohibitive at first. But those who have purchased this sheet set often say that they’ll never go back to sleeping on cotton sheets again! No Top Fold on Flat Sheet. 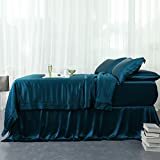 Probably because of the cost of the silk fabric, the top of the flat sheet does not have the standard wide fold-over that is normally found on a regular flat sheet. The edge of the silk all the way around the flat sheet is simply a ½” hem. This makes it a bit more difficult to determine which way is the top, but the tag at the bottom is an easy indicator. 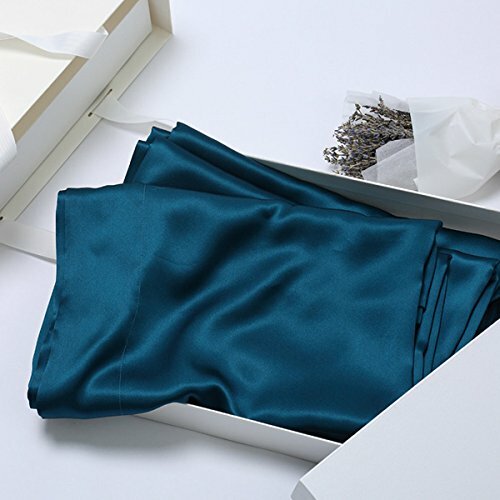 As a company, Orose is dedicated to providing high-grade, real silk products for its customers. Silk sheets, pillowcases, sleepwear, and other accessories are available from the company. Orose enlists a strict quality inspection procedure to be sure that its products are the best, and it offers a 30 day unconditional return policy, as indicated on the company website. The company functions under the name Nanjing Jia Bai Da Technology, is located in China, and has customer contact options available through email. Finding out what actual users and reviewers of a product have to say about it helps in making the best possible purchasing decision. 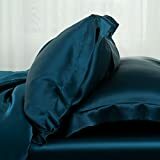 Here’s what these independent and Amazon reviewers have to say about the Orose Charmeuse Mulberry Silk Sheet Set. 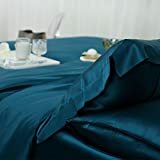 One verified purchaser notes that this silk sheet set is comfortable, beautiful, and also very easy to care for. She has washed her set multiple times and on the hand-wash cycle of her washer, and dried it on low in her dryer. The sheets come out looking great. Her only concern is the fact that the flat sheet does not have the typical larger fold at the top of the sheet, but the hem is just ½” in all the way around. She says they are cool, wonderful to sleep on, and they are well worth the price! Another Amazon reviewer declares that these sheets are ‘absolutely splendid!’ His only regret is that she waiting so long to purchase them. They are smooth, soft, lightweight, and help to keep your body temperature regulated. A different Amazon reviewer bought two sets of these Orose silk sheets and loves how amazing and smooth they feel on the skin. She highly recommends this product for people who are looking for a higher quality of sleep and the great feeling of silk on the skin. This set of silk sheets by Orose offers a high quality set of sheets that are handmade to the best standards. The silk is durable and luxurious, and seems to be loved by everyone who uses it! This is a long term investment in a high-quality, long-lasting set of silk sheets that will not disappoint.